Just a brief post to tell you that I’ve migrated my photo album (which was previously managed using Coppermine) to Flickr. 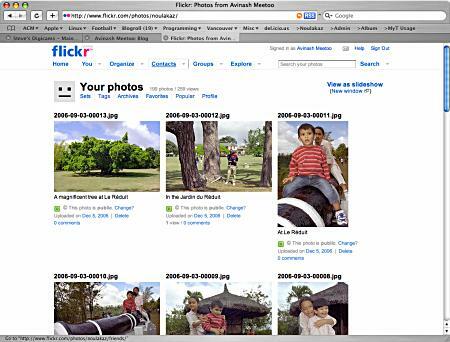 Tu utilises un lien externe afin d’accÃ¨der Ã tes photos sur flickr. Pourquoi ne pas utiliser un plugin de wordPress afin de visualiser directement les photos via les pages de ton blog. Et sinon fait attention aux limitations du “free account” de flickr. i was looking for smtg to manage my photos..
so i just created an account on flickr..
i’ve also created a web album on picasa..
and c which one is better..
finally i made my choice..
embedding the album onto blogger is way too easy..
it gives more spaces..unlike the 20mb/month of flicker u get 250mb..and this can b upgraded..
unlike with flickr whr i had to restart the uploader quite a few times..